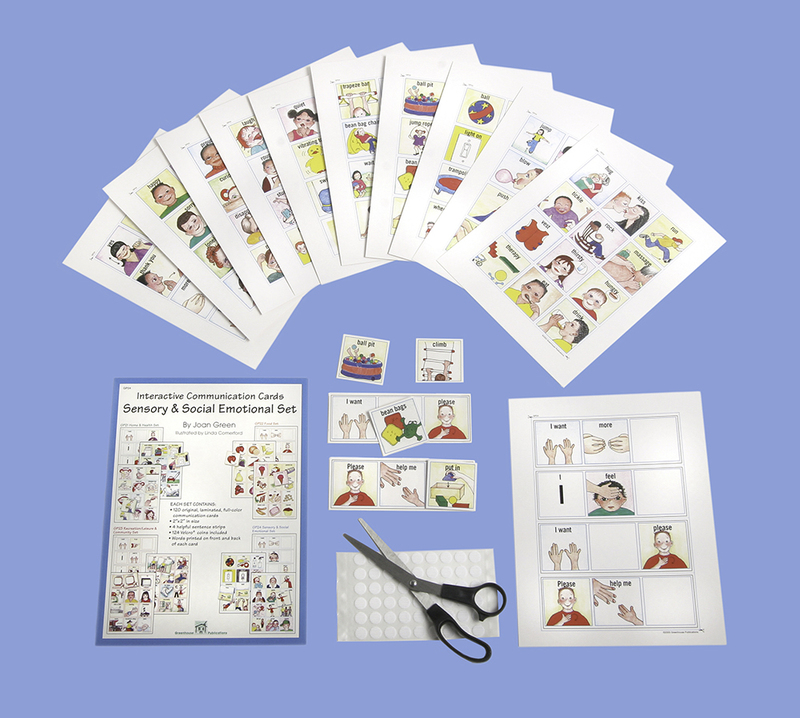 The SENSORY & SOCIAL EMOTIONAL SET contains 120 laminated, 2" x 2", full-color pictures that pertain to sensory and social emotional issues. Activities depicted can be used in occupational therapy sessions, adaptive PE, rehabilitation centers, hospitals, home or school. Pictures also depict emotions of how a person might feel in a variety of settings, plus common terms pictures, 4 appropriate sentence strips and velcro (hook and loop). #GP24 - $29.95. Order by clicking button below. 2. Use SENSORY & SOCIAL EMOTIONAL SET of picture cards as choice cards. The student can choose his desired activity. 3. Use SENSORY & SOCIAL EMOTIONAL SET of picture cards to play, "How do they feel?" Pick out or turn over an emotion card and have the student act out or label the emotion. 4. Use SENSORY & SOCIAL EMOTIONAL SET of picture cards in empathy training. Put out several emotion pictures. Then, either read from a book or simply ask a question, (ex: "Amy cried when her mother drove away." How do you think Amy was feeling? sad? happy? mad? "Robert screamed when he saw the rat!" How do you think Robert was feeling? Surprised? Scared? Shy?